If my readers have learned anything by now, it’s that Sandy hearts Jamie. His cookbooks have been and still are constant inspiration for new dishes and ideas. 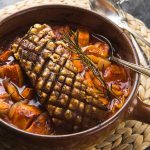 This slow roasted piri piri pork belly has become a favourite in our house after we first tried it about 2 years ago. 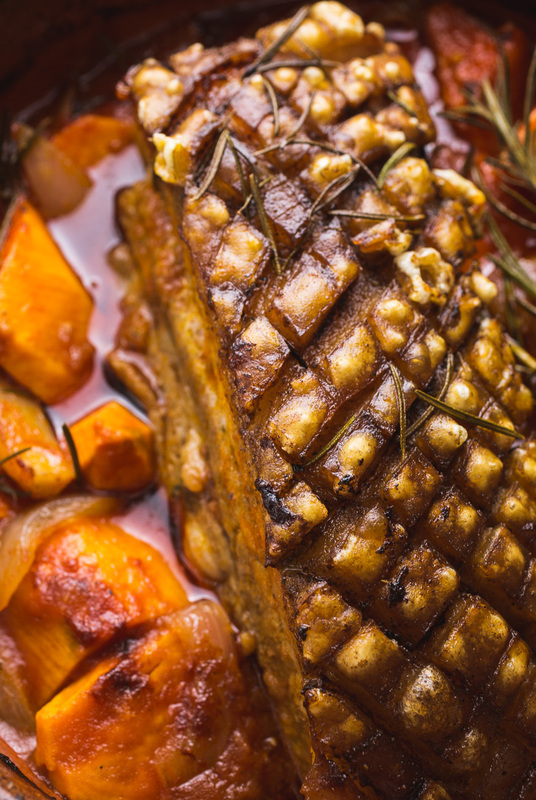 Tender, juicy pork belly with some amazing crackling on top, served in a spicy tomato sauce with sweet potatoes. It’s the ultimate comfort food. Here you see a version, that differs slightly from Jamie Oliver’s recipe, because his recipe left me a bit confused. He calls it piri piri pork belly, but the recipe doesn’t call for piri piri chilis. What went wrong there, Jamie? I mean, of course, you can use any hot chili you fancy, but if you already have piri piri in the name, using piri piro chilis might be the logical consequence. I fixed that for you, Jamie darling, along with a few other tweaks. You’re welcome! 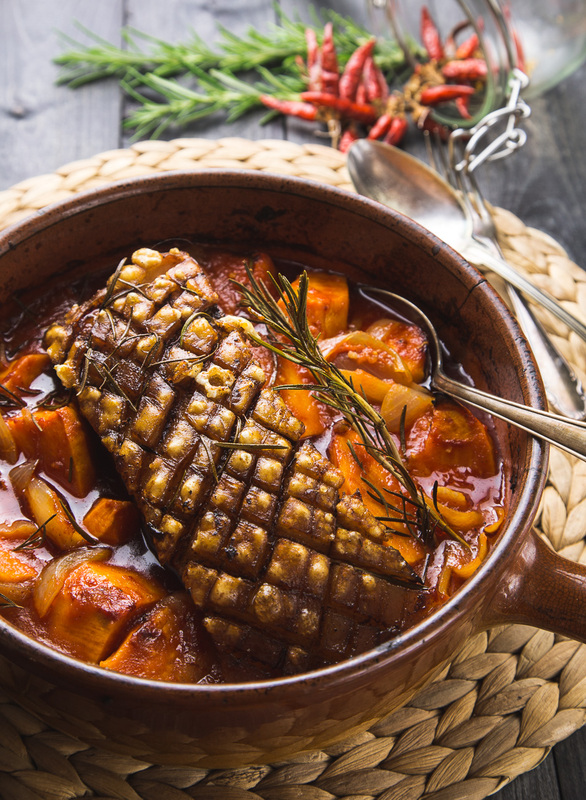 Tender, juicy pork belly with crispy crackling on top, served in a spicy tomato sauce with sweet potatoes. In a pestle and portar smash up the bay leaves with the salt until you have a paste. Add the chilis, smoked and sweet paprika, black pepper and olive oil and work it some more, until everything is smooth. With a sharp knife score the skin of the pork belly in a tight criss cross pattern. Be careful not to cut into the meat underneath. Massage the marinade into the pork belly, giving special attention to all the cuts on top. Place the onions and garlic on the bottom of a roasting tray. Peel the sweet potatoes and cut them into large chunks. 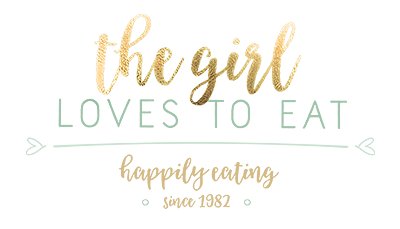 Add the the roasting try. Finely slice the chilis and add them to the roasting tray. 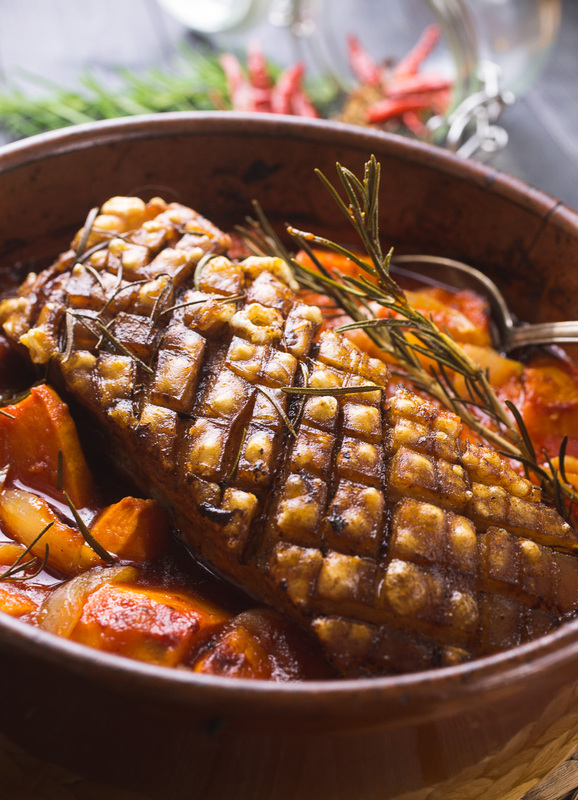 Place the pork belly on top and roast in the oven for 45 minutes at 200°C / 392°F. After 45 minutes take the roast out. Add the passata, white wine and water to the tray. Season with salt and pepper and stir well. 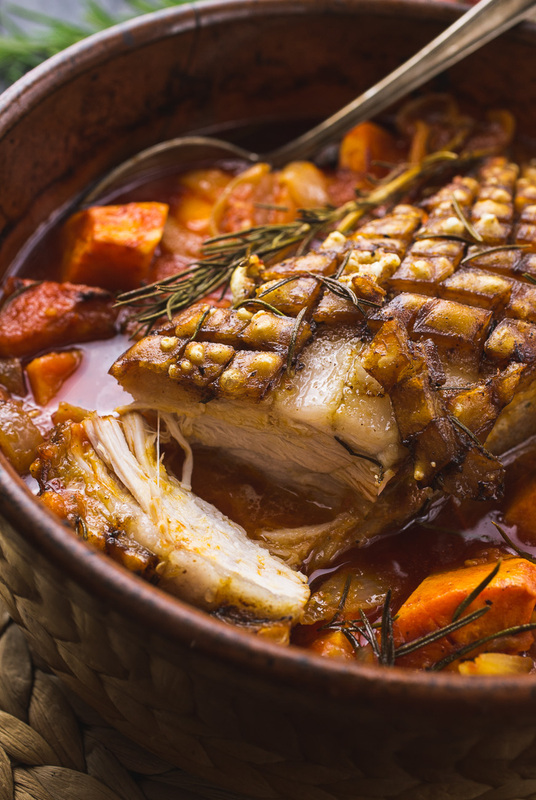 Turn your oven down to 170°C / 338°F and roast the pork belly in the sauce for at least 2 hours. In the final half hour of the roasting process add two twigs of fresh rosemary to the top of the roast. Skim the fat from the top of the sauce before serving. Serve with anything you fancy. Fresh bread, a green salad or some rice.